Air conditioning repairs and maintenance are common—if it’s time to get your AC checked out, be prepared to tackle a host of next steps from a simple filter replacement to a system overhaul. Going in, though, it’s important to understand common repairs and the factors that can swing costs up or down—things like size and age of your AC unit, for starters. #1. How old is your AC system? Not surprisingly, older AC systems tend to be costlier to repair—and in AC years, “old” can be anything over 10 to 15 years or so. The older your AC gets, the more likely it is to keep breaking down and, simply, to need scheduled maintenance. Those costs can add up. A good rule of thumb? Get an estimate on your latest ac repair needs and multiply it by the age of your system. If that number exceeds $5,000, it could be time to consider a new air conditioner. So, for example, if your system needs $700 in repairs and it’s 18 years old, that’s $12,600—much more than the $5,000 threshold. Likewise, if it’s $300 to repair a 10-year-old system, it probably makes sense to repair it again. Not sure where your system stands? Get in touch with our expert team at American Heating & Cooling to weigh your options and determine the next steps. #2. When are you booking repairs? It’s a simple case of supply and demand—if you need AC repairs in the summer, you’re competing with everyone else who’s firing up their system and discovering it’s in serious need of TLC. Very simply, that could drive your bill, especially if you need emergency or last-minute repairs. Deal with issues or, simply, schedule preventative maintenance in the winter and you’ll likely pay less—teams aren’t as busy and you’ll have plenty of time to deal with any issues that arise. #3. How big is your AC unit? Like anything, bigger often means more time and labor to repair. A larger AC system often costs more to maintain and repair. The smaller—or more efficient—the air conditioner, the less you’ll likely spend on ongoing repair and maintenance. If you’re considering a new system, consider that—you may pay a little more upfront, but you could save in the long run. #4. How well is your AC unit maintained? If you’ve been maintaining your air conditioner, repairs will likely be less costly and less frequent. Again, by investing a little more upfront—and, in this case, over time—you’ll likely curb repair costs and keep your AC running for years or even decades. By changing filters, cleaning coils and scheduling annual assessments, you’ll be able to get ahead of problems before they start. American Heating & Cooling can help keep maintenance in check. We offer a host of ongoing and scheduled maintenance plans to ensure your system is always up and running. #5. How bad is the damage? Need a new filter? Plan to spend $20 to $30. Need a major leak repaired? You could wind up spending $1,000, $2,000 or even more. In short, it’s all about the extent of the damage. Major damage can, unfortunately, come with a major price tag. If you wind up on that end, get in touch. We can help you determine whether moving ahead with repairs—or with a new system—makes sense. Contact us to learn more. Keep your heating and air conditioning systems running better with our preventative maintenance program. "I had nine house guest this weekend. My brother in law, sister in law, niece and new baby were all staying in the basement. I had not been in the basement in months. They woke up Saturday morning freezing. The unit was down. Laura called American. Chad came right out and fixed the unit. He was prompt, efficient, pleasant and a good representative of your company. Just thought you should know. See you next time." We do one thing and we do it best!  Local experts in heating, cooling and HVAC systems.